For the past several years our Congregation has supported LifeStyles of Southern Maryland in their efforts to alleviate the suffering caused by homelessness. Each year the organization sponsors the “Walk to End Homelessness,” to which we provide both walkers and financial support as part of our obligation of tikkun olam, to help heal the world. We are again asking all members to support this effort by walking and contributing $15 per walker or $25 for a family. Even if you’re unable to walk the 3 miles, you can still make a contribution. All contributions should be sent to the Congregation, and be earmarked for this effort. Please e-mail Abby Nabors at anabors76@gmail.com with the names of walkers and mail your contribution to Sha’are Shalom at 18 Henry Ford Circle, Waldorf, MD 20602. Checks should be made payable to Sha’are Shalom. Cash or check may also be received the morning of the walk or during Religious School. Contributions should be submitted by Nov 8. 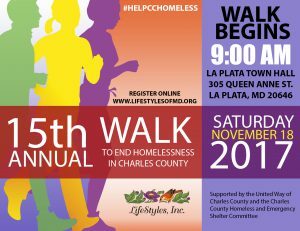 Over the past fourteen years, the Walk has raised over $135,000 in funds that have supported programs to expand services to homeless residents of Charles County. The funds raised through this walk, along with other contributions and grants, enable LifeStyles to help the homeless by providing food, clothing, a place to shower, and help to get on their feet. During the late fall and winter, Life Styles operates a “Safe Nights” program providing housing for eligible homeless individuals to have a warm and safe place to spend the night. On average, LifeStyles sees approximately 14,000 people annually. In the last year, LifeStyles distributed 119,134 pounds of food and fed over 6,000 families and individuals. They also provided over 5,000 bed-nights to those in need during the harsh winter months, and helped over 200 people find permanent housing. Those walking on Nov 18 not only receive the satisfaction of knowing they are helping but will receive a souvenir of the walk from LifeStyles as a thank you.